Stuck staring at a computer in that tiny, windowless cubicle? Looking for an opportunity to better your life and your career, while making a difference in the world? Then becoming a truck driver could be the right move for you. 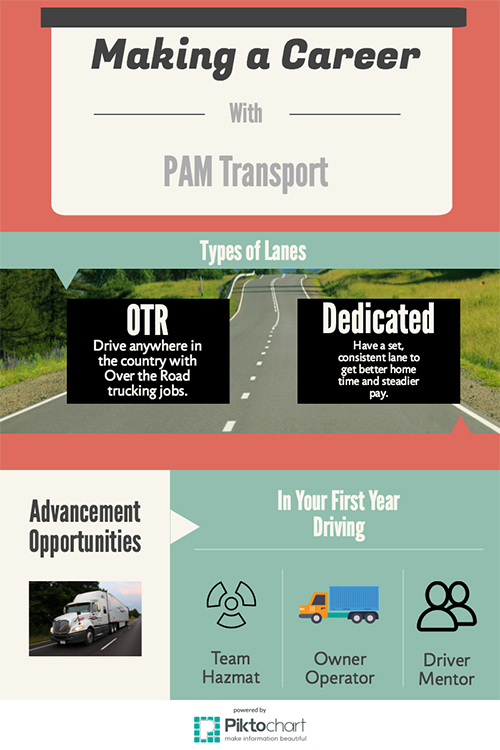 Have you ever considered becoming a truck driver with PAM Transport? Driver Solutions and PAM Transport can help both inexperienced and veteran drivers find career opportunities that set them up for a long-lasting, successful stay in the transportation industry. One thing that separates PAM from other carrier companies is the career and advancement opportunities available to drivers in just their first year. Driving Team Hazmat means you've added your Hazmat endorsement to your Class A CDL. You get paid more per mile with a Hazmat endorsement on any load you pick up, even if its non-Hazmat freight. By hauling this type of freight as part of a team with another driver, you'll be able to maximize your income, while having the ability to run more miles than you normally would as a solo truck driver. After just 9 months of driving with PAM, drivers are eligible to enroll in the company’s lease purchase program. This program allows you to purchase your own rig, and become an Owner Operator. There is no credit check required to take advantage of this opportunity. This is for those with the entrepreneurial spirit who want the chance to manage their own mini-business on the road. After 6 months of driving for PAM, you'll be eligible to apply to become a Driver Mentor. This program pairs you up with new PAM truck drivers, where you'll teach them and coach them through "real world" driving experiences. What's stopping you from making the best career decision for you and your family? When you choose to drive for PAM, you'll find plenty of advancement opportunities in just your first year on the road. Don't wait another minute, apply today!